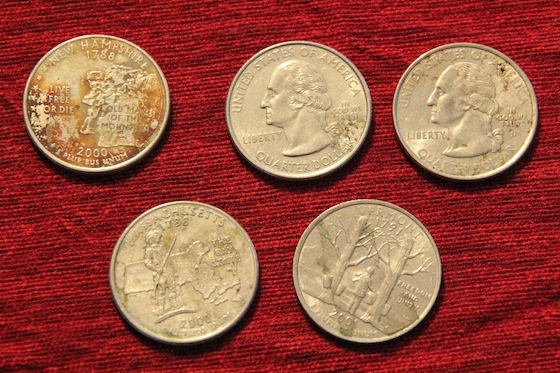 A while ago, when they were first starting to mint them, I was collecting the US States Quarters Series. 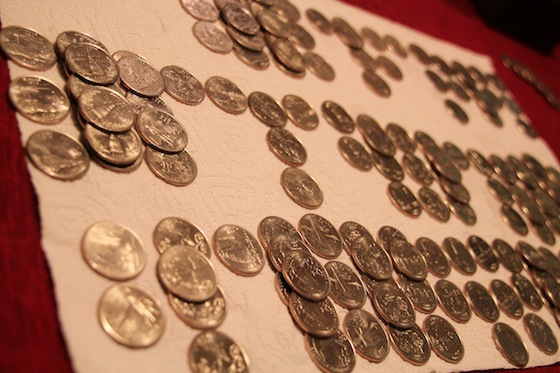 Over the years I stopped and my collection is probably in the back of a drawer somewhere in the house; but recently when I was counting out our till at the teahouse, I thought, what a great opportunity to get a load of those quarters back! Of course, I would have done better if I had started looking through the quarters when the teahouse was still in business, but there were still a good amount of quarters in the till and from our tips collection. I decided to wash the whole lot. 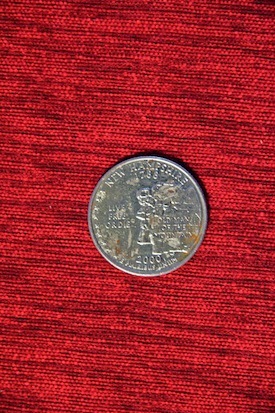 I had read about cleaning coins with sodas like Coke and Dr. Pepper because they have phosphoric acid in them, which actually in its pure form, is used as a rust removal agent (lemon-lime sodas have citric acid in them, and they’re also reported to have similar cleaning uses). 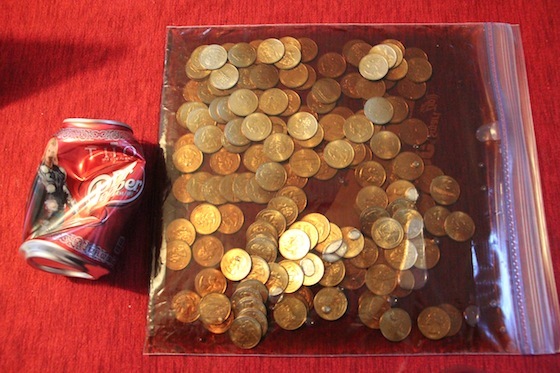 I thought that sounded cool, so I decided to shine up my treasure of quarters with some cola. 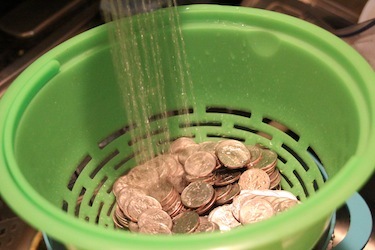 I dumped all the coins in a gallon-size Ziploc bag and poured in a can of Dr. Pepper. 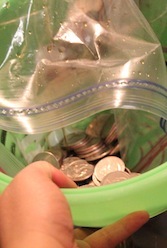 I wanted to make sure all the quarters were submerged, so I spread them out evenly after squeezing most of the air out of the bag. I left them in their soda bath overnight. I noted which ones were particularly gross, and today I went over a few of those with a toothbrush. Then I dumped them all in a colander and rinsed them off. I sudsed them up with a bit of dishwashing liquid and gave them a second rinse, just to be sure all the sticky soda was washed off, and placed them all out to dry. While the toughest ones didn’t come out immaculate, look at the before and after! This was a cool little experiment. I do have to note that while perusing snopes.com for corrosive cola stories, I learned that while the phosphoric acid in these sodas probably does have a bit to do with their cleaning abilities, the main reason they can be used as cleanser with good results is because they contain carbonic acid (which is why people use club soda on fresh stains – and club soda doesn’t leave a sticky residue!). Citrus sodas on the other hand may have more acidity in them. 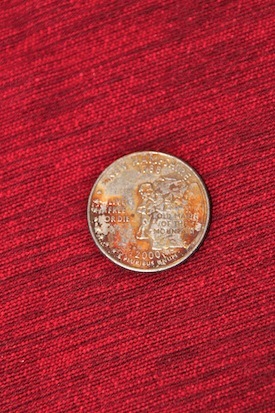 I should also note that it is absolutely NOT recommended to clean coins that you think may be valuable – you could severely lessen the value (say, all the way down to face) of the coin by removing the patina that develops when coins age. Since these are so new, I wasn’t afraid of that. If you are collecting the States Quarters Series (or the new “America the Beautiful” series), I highly recommend cleaning them so they look bright and shiny. I can’t wait for my collection to be complete!